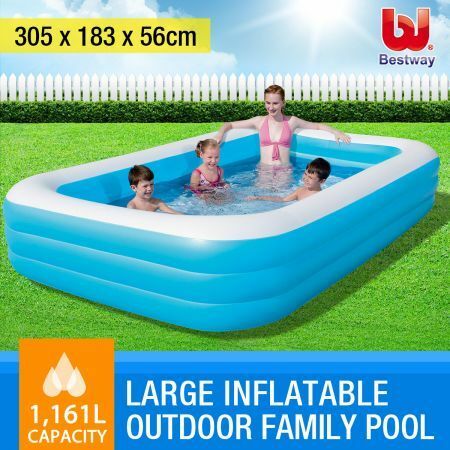 Now you can have your very own kids pool set up in minutes with the BESTWAY Blue Rectangular Large Inflatable Outdoor Family Pool - 305cm x 183cm x 56cm! 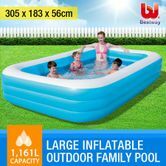 Easy to set up, the Bestway Blue Rectangular Large Inflatable Outdoor Family Pool is large enough for kids to play a sunny afternoon away. Featuring sturdy l-beam construction, the Blue Rectangular Large Inflatable Outdoor Family Pool can accommodate a small backyard without having to spend a fortune. Great way to introduce children to the fun and joys of water, offering them the freedom to move while being completely monitored under a parent's supervision. Being inflatable means you can have the convenience of deflating and storing your pool away when it is not needed. Sturdy and safe to use, no sharp edges. Made from durable vinyl making it tough enough for generaly use. Should the pool need repairs, a heavy duty repair patch is also provided. Affordable, backyard, family fun starts with Bestway’s Blue Rectangular Inflatable Outdoor Family Pool. This extensive line of inflatable products has all the fun in the sun covered, whether at the beach or in the pool. The wide selection are sure to bring hours of enjoyment to both children and adults. 305cm x 183cm x 56cm approx. (L x W x H) 305cm x 183cm x 56cm approx.